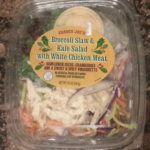 This salad was pretty good – no major complaints, but it wasn’t “the best salad I’ve ever had” or even one of the top TJ’s salads like some others I’ve had. The dressing’s good, and the ingredients blend together fairly well, if a little boring. One of my favorites, though sometimes the lettuce is not fresh. 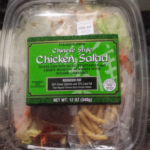 The salad dressing is tangy but not too much so, and it’s quite a nice sized portion. White chicken meat, vegetables, and crispy wonton noodles with sesame dressing.